As I sit here with cold feet and chilled arms, I can't help but long for warmer weather! Last night I told T that I was moving to Hawaii as soon as possible. I wish I could follow through with that! The Amelia Peabody series by Elizabeth Peters -- Set in Egypt, the sun is always blaring in these books. The Secret Garden by Frances Hodgson Burnett -- This book makes me long for a garden where I can just lay down and read and absorb the rays. A Caribbean Mystery by Agatha Christie -- I too would love to be on the beach, enjoying cocktails and swimming! I can absolutely relate to both the sentiment and the books! Unfortunately, I saw the Mystery in the Caribbean movie not too long ago, or I'd probably pull it off the shelf today, now that you've reminded me of it. I totally agree with regards to the Amelia Peabody series and thoughts of searing sun. I'm not a huge fan of hot weather, but this winter has been a bear. These all sound wonderful! I haven't read any of them but I have heard of Amelia Peabody and it really interests me. Thanks for the great list! Solsticia - Yes, we've had an unseasonably warm winter here in the Pacific Northwest but it still feels cold! Jane - I think I'm going to restart the Amelia books soon. I think there is a new one this summer too! Rebecca - Amelia Peabody books should count for the Women Unbound challenge! She's awesome! I have not read any of these titles either!! 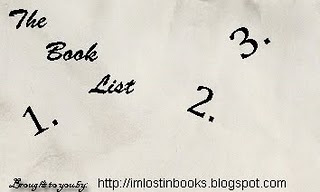 I've been thinking about this list lately and I just cannot seem to come up with three books!! It is beginning to make me wonder if I am just into drab and dreary these days! !